Cummins-Peterbuilt tractor trailer gets close to 11 mpg. The EPA's proposed standards for new diesel trucks are too little and too late. They would increase fuel efficiency to 9 mpg in 2027. 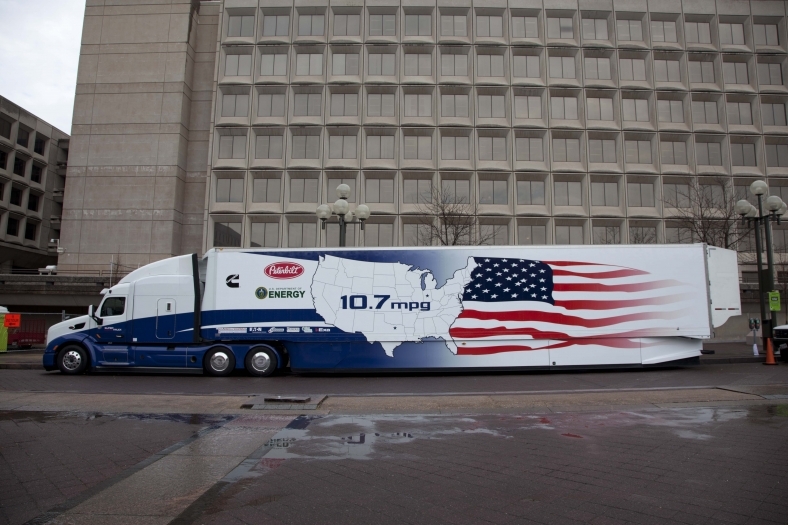 Trucks from the DOE Supertruck Program get 10.7-12.2 mpg right now. Tell EPA we can and should do better. As health professionals concerned about the growing health impacts of climate change and the toxic effects of diesel pollution, we strongly support improved fuel efficiency standards for medium and heavy duty diesel trucks. Our concern is that the proposed standards fall short of what is achievable and that the difference between what is proposed and what is possible will be counted in human lives and suffering and the permanent loss of a habitable planet. According to the most recent Fifth Assessment Report of the IPCC, global greenhouse gas emissions must peak by 2020 and decline rapidly thereafter to avoid irreversible catastrophic climate change. At this time we face a very large gap between what is necessary and what the world's governments are committed to do, with a projected warming increase of 5 F (3 C) (Reuters, 2015). 2020 is only five years away. As the largest historical source and second largest emitter of GHGs, the US must cut our emissions as steeply and deeply as possible if we want other countries to do the same. 35 million Americans live or work within 300 meters of a major roadway and are exposed to diesel pollution. Health consequences include adverse birth outcomes, childhood asthma, impaired lung development, cancer, heart disease, and premature death. (EPA 2002, 2014). This hazardous exposure should be decreased to the greatest extent technically and economically feasible in the shortest possible amount of time. The need to lower diesel consumption is urgent, the cost of failure unthinkably high and there is no justification for delay or half measures. We strongly urge you to tighten the proposed fuel consumption standards and shorten the implementation timetable. In addition, because diesel trucks last for up to 30 years, fleet turnover will be slow. It is important that, in addition to setting standards for new vehicles, EPA mandate retrofits of trucks already on the road. American Council for an Energy-Efficient Economy (ACEEE), “Further Fuel Efficiency Gains for Heavy-Duty Vehicles”, September 25, 2013. http://aceee.org/fact-sheet/heavy-duty-fuel-efficiency.